For all my upcycling friends, it’s time to get busy in Santa’s workshop. If you are still contemplating what to make for your loved ones for Christmas, why don’t you sew up a pair of upcycled slippers? Some of you may have already purchased one of my upcycled sweater patterns and have experience sewing with felted wool sweaters. Others of you may not even know what I am talking about. Making something out of a recycled sweater is so fun and rewarding. There are so many things you can create with this yummy fabric once it is felted. If you want more information about how to felt wool sweaters, you can check out the tutorial HERE. 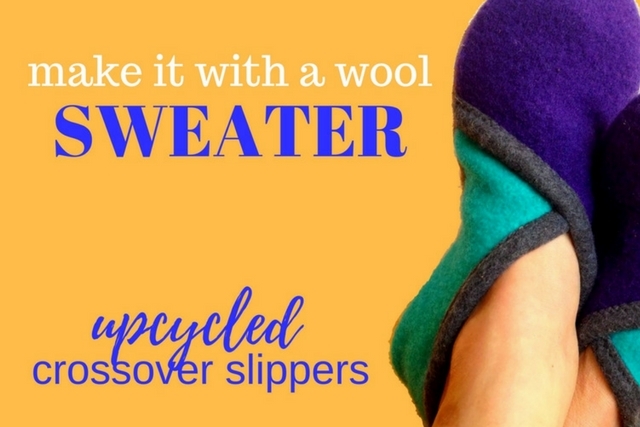 Today I want to give you some tips and tricks to use while making up a pair of upcycled sweater slippers. Using a regular sweater as the sole, is softer and a bit more cozy. However, if you have hard wood floors or tile in your home, they can be a little slippery. Sometimes when you shrink down a sweater it can get really dense and thick. These sweaters are more difficult to use on other craft projects, but work well for the soles of slippers. The only drawback here is that they can be a little more challenging to sew with because they are so thick. These fabrics can be really nice to sew into the soles of slippers for LITTLE PEOPLES feet. Most likely you have seen the fabric on the bottoms of children’s one piece pajamas. You can find this fabric on the bolt in most fabric stores, or in pre-cut packages. It is also available online. Another thing to do to prevent slipping and works better for adult slippers, is simply using rubber shelf liner. It is inexpensive and easy to work with. You can get it at most stores and online here. *When using either of these two fabrics, you will be cutting out a regular sole piece with a regular weight sweater AND the anti-slip fabric. You will stack those two pieces together and treat them as the sole piece. Sewing in a leather or suede sole can be really nice. It will make the slippers much more durable and can be less slippery. Working with leather can be a little more challenging, as it does not have any give to it, but not too big of a deal. I love sewing on leather. 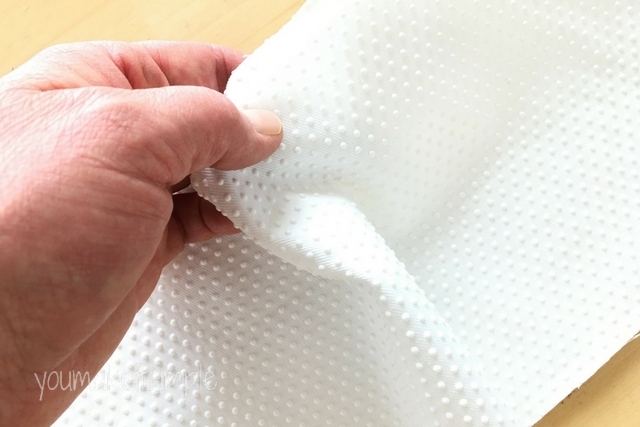 The only thing is that you will want to make sure it is a nice soft piece and not too thick. When cutting out pattern pieces with felted wool sweaters, you want to maximize the fabric. (It’s crafting gold) Place the pattern as close to the edge as possible. Arrange the pattern to use up the best space possible. Felted sweaters will not fray. So don’t worry about that. If the sweater has a print, stripe or design, you will have to take that into consideration the placement of the pattern piece. Another tip I give in the pattern tutorial, is to USE SAFETY PINS to help mark the RIGHT SIDES of the fabric. Applying a safety pin to each pattern piece will help keep things straight when putting everything together! Don’t forget to SAVE YOUR SCRAPS! There are so many fun things to make with all your scraps. Sweater balls, hearts, dryer balls, etc. can all be made with small pieces of sweater fabric. I came up with this technique that saves time and is much easier when sewing binding on something. However, this technique can only be used if you are using fleece or a stretchy piece of felted wool. The reason is, is that fleece and felted sweaters DO NOT FRAY! I Love applying fleece binding. You can read more about how to do it here. This is such a cool way to apply the lining to a pair of slippers without all the bulk and having a seam showing. Using this technique can be a little difficult to wrap your head around, so I thought I would clarify the process and show you a little clip of my online class on how to do it. I just published another SKILLSHARE CLASS showing how to make the CROSSOVER SLIPPERS. I show you how to make a pair with step by step video instructions. If you are like me, I am a visual learner and being able to actually watch someone do something is so much easier for me to wrap my head around instructions. 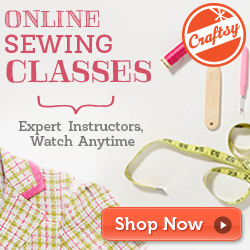 These online classes are so helpful, I hope you will check them out. For those of you who don’t have a skillshare membership, I am offering this class for FREE this month to all my blogging friends. You won’t have to sign up for a membership, just sign up and register with your email. You will get 3 months FREE and then have the option to join. Skillshare is quite amazing and you can learn how to do almost anything by video classes. I really like it. This free offer is only good for the month of December! So if you are at all interested, I would jump on it. Enrollment in the class includes the PDF printable pattern! I hope this was helpful, and I hope you take some time this season to create something fabulous using an upcycled sweater.